The Grit, Athens GA – Marie, Let's Eat! I used to work with a girl in Athens named Alexia who was militantly, albeit comedically, vegetarian. She took her comedic militant vegetarianism to extremes, even suggesting that with a little conditioning, lions could be taught to enjoy a healthy salad instead of a nice gazelle. Well, maybe I suggested that and she just agreed with it; it’s not the sort of thing that rational people propose. Anyway, she ate at the Grit almost exclusively for ages. As the city’s pre-eminent vegetarian restaurant for years, the Grit has had many proponents and champions, but none, perhaps, louder than Alexia. So, to me, the restaurant’s sort of intrinsically linked with her. And to lions and gazelles. 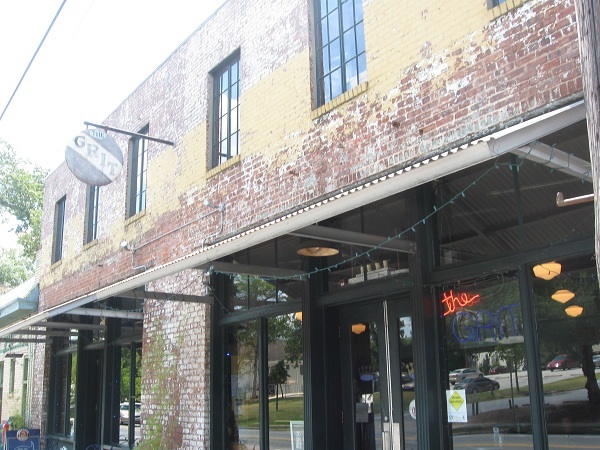 The Grit opened in 1987, a couple of years before I moved to Athens, and immediately became a very popular destination among friends and acquaintances. I was never a fan, myself. I recall taking somebody to dinner here once at her request, and while I don’t remember what I had, I know that I was not impressed. Years later, I gave it another try, and sampled their nachos, because Rainbow Grocery in Decatur, where I spent much of 1990-91 swooning over a waitress, had terrific vegetarian nachos. I still wasn’t impressed. Alexia told me that I had been ordering the wrong thing. What I really needed to try was a Grit Staple. 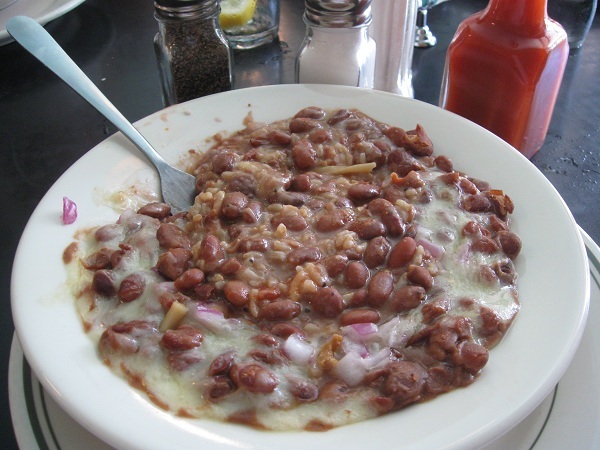 This is just a big protein bowl of beans, rice, onions and cheese. I still wasn’t impressed. It was just an agreeably bland, downscale variation of what I could have been eating as a side at the Mean Bean, my favorite restaurant. Nevertheless, I ended up at the Grit a few more times over the years in the company of people who enjoyed it more than me. I just invariably ordered the Grit Staple. It was never bad, even if it needed salt, pepper and hot sauce, and after all, my earlier experimentation had put a dampener on trying anything else. But two weeks later, we were back in town to give the Grit a try. I wondered whether I’d have enough of a positive experience to make a write-up here worthwhile and, happily, I did, otherwise I would have deleted the pictures and moved on. The Grit Staple was as agreeably bland as ever, but each of the kids had simply superb meals, far better than any of the limited menu items I had tried in college. They do all sorts of great tricks in the kitchen with wheat gluten and tofu and they turn out surprisingly tasty meals. My daughter enjoyed a noodle bowl with a spicy and sweet ginger sauce and my son tackled a seitan gyro – new to the menu and served with a small “Mediterranean-style” salad – with gusto. Both the faux chicken in Ivy’s bowl and the seitan steak on Julian’s sandwich were terrific, spiced just right and tender. Normally, I get a little menu envy, but this was just plain ridiculous. Both the kids had considerably better meals than I did. Now what’s fair about that? My daughter keeps flirting with vegetarianism. This started one night about four years ago when she decided to use it as an excuse to get out of some chicken tenders that she wasn’t enjoying. As she paused for breath after inhaling half her bowl, she said “This soup is amazing, and if it was a man, I would marry it.” The Grit’s about to celebrate its 25th anniversary and my daughter insists, rightly, that she wants to go to school in Athens. If so, I can imagine her being every bit as militant about this place as Alexia had been. Me, I like a gazelle every once and again. Posted on August 3, 2010 July 29, 2017 by Grant G.Posted in athens, casual american, georgia, vegetarianTagged athens, casual american, georgia, normaltown, vegetarian.